The AMME Report was launched on the November 2016. The Chair of the study was Dr. Rob Hardeman, Vice Chair of the MATRIX panel. date. Building on the 2013 UK Foresight Study – “Future of Manufacturing: a new era of opportunity and challenge for the UK”, the report re-examines the future of advanced manufacturing in Northern Ireland and its importance to the local economy beyond 2016. Over the course of this study we engaged with many AMME business leaders, academic partners,representative associations and government bodies – locally and nationally. 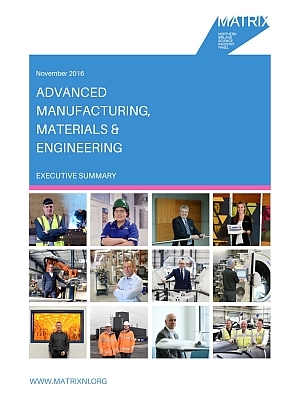 What we learnt from that engagement, combined with the use of extensive data sets from a wide range of sources is that there is a surprising level of sustained activity and export achievement given many reports of the “demise of manufacturing”. We have a strong manufacturing heritage, which still lies at the heart of industries in NI. In fact, there is still a higher percentage concentration of manufacturing businesses here than there is in the UK as a whole. During the downturn, manufacturing industry here kept on track better than other UK regions. R&D didn’t fall away and exports, largely speaking, remained strong. So we have a big and vibrant sector with a fascinating range of companies and products and the signs are good. NI AMME needs leadership and a voice. In terms of looking towards key opportunities for growth in the future, we need to identify, grow and compete in the global market on our key strengths – and to do that we need to, as a region, exploit that which differentiates NI AMME from its competitors. We need to shout from the roof tops NI’s AMME reputation for innovative design and the world leading quality and reputation of our engineers. In the report we talk about NI AMME’s ‘strength in adaptability’ – the sector has shown its ability to diversify and respond to the changing demands of manufacturing of the future, which when combined with an already high degree of specialism and excellent service, means NI AMME is ideally placed to take advantage of niche global requirements – always building on the great heritage and brand of NI engineering. NI has a strong cohort of individual AMME companies making a very significant contribution to the local economy – these companies are competing globally and are Research & Development and Innovation (R&D&I) intense. (together these 3 groups account for 39% of top AMME performers). Individual companies classified within AMME as ‘Highly Specialised Individuals’ together account for over 30% of top AMME performers. The ability of NI’s AMME businesses to innovate successfully and diversify to pursue long-term growth paths is clear. Investment in R&D over a prolonged period and sustained throughout the downturn is a clear signal that R&D is embedded across the top 200 AMME performers. Many of NI’s top 200 AMME companies (38%) are established 25years +; of which over a fifth can trace their roots back more than 40 years. Irrespective of the particular area of AMME they are employed in, NI’s AMME professionals are globally respected, with NI engineering firmly reputed for excellence in quality, innovation and cutting edge design. What AMME companies told us – what matters most to AMME companies in NI today? Consistent with many other AMME communities, by far the most important issue concerning NI’s AMME leaders is the availability of the right number of relevantly qualified workers at the right time. 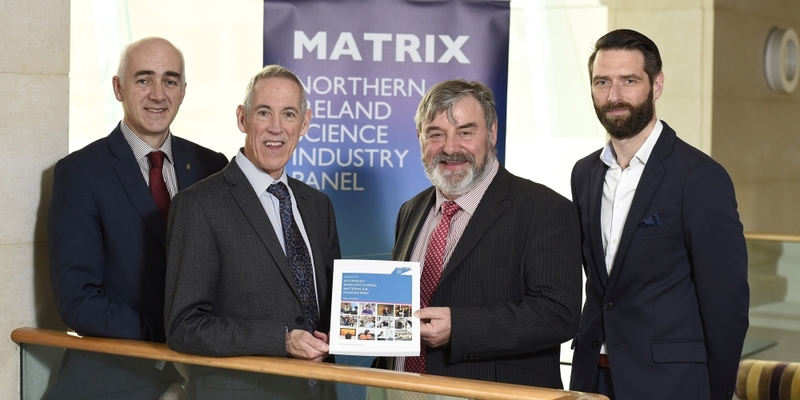 Matrix wholly endorses the earlier findings of the 2015 NI Skills Barometer and the recent and proposed developments within NI Apprenticeships. In that context, AMME skills are considered in detail in the report, along with a number of suggested potential recommendations to Government, Industry and Academia. As with skills, the issues raised are not unique to NI, and not all are of equal concern to each AMME company. However, when taken together, the key concerns around energy, foreign exchange, corporation tax, rates stability, logistics costs and others present significant challenge to a sector which has been under persistent threat over recent decades. There is a general acceptance that some of these areas fall outside NI control. However, the recommendation to government is that, when policy is being developed, that the impact on NI’s AMME businesses is front and centre of decision making. This report points to the recommendations relating to costs within the 2016 Oxford Economics report commissioned by Manufacturing NI. NI’s combined AMME strength is a formidable force, in any context. The companies have grown, diversified, survived the recession, sustained their investment in R&D and are now hitting global playing fields with renewed purpose. The impact of sectoral development already undertaken is evident (e.g. the Aerospace, Security & Defence Group (ADS) and SC21 for the Aerospace, Defence, Space & Security sector and the work of the Northern Ireland Polymer Association for polymer businesses). With confident and ambitious leadership, NI’s AMME combined capability can be further developed and promoted effectively for the benefit of all. The report draws out specific recommendations pertaining to sectoral development. School children need practical, hands-on experience to be able to visualise AMME and its potential value in a way which they can relate to. An important first step would be the teaching of STEM through objects vs only through paper (i.e. practical vs theoretical learning). The role of colleges in the school/FE/HE education continuum providing vocational training for youth and continuing education for employees needs to be considered. Matrix should ensure that, as the NI Economic Strategy is refocused within the context of the new Programme for Government 2016-21, that the Department for the Economy is supported and encouraged to continue to build on the current STEM agenda and (important) small gains recorded. This is an essential step to ensuring the delivery of economically relevant skills and qualifications for the AMME sector in the future. Public funding of university-business collaborative R&D – Leverage and Value for Money: the development of metrics that identify and measure commercial outcomes as well as those for the university are important, not least in the context of constrained public spending environment.  Mechanisms which streamline industry-university engagement should be reviewed in light of becoming more flexible and dynamic – to the benefit of all parties, taking into account ease of access to collaborative R&D for SMEs in particular. Businesses should be encouraged to seek out collaborative opportunities, wherever they lie, based purely on expertise and to look beyond localised networking, where appropriate, to avail of that expertise (e.g. explore HVM Catapult links). Regional funding for collaborative research should be directed to best meet the needs and growth of AMME businesses, irrespective of location of research partner. Additional HMRC resource available to NI businesses via its NI Corporate Tax Office (NIrCTO): DfE should renew efforts to ensure all eligible businesses are aware of the totality of support available to them under the HMRC incentives and reliefs – taking full advantage of NIrCTO’s expertise and guidance. The opportunity to scope a government-led ‘whole of AMME R&D&I solution’ in response to industry needs within the established Catapult framework should be examined further. With regards scaling, the need to examine how some of the ‘affinity groups’ of AMME business could move into a form where their combined activity would move them to the next level is recommended. With the appropriate policy in place, Invest NI would be well-placed to work with companies to facilitate that movement. A potential pilot around the application of ADS initiatives to NIPA members would be an ideal starting point. Explore potential to develop a tailored AMME package of support (e.g. akin to Liverpool LEP advanced manufacturing initiative). Sector- specific and across full spectrum of R&D&I to include e.g. skills, trade, etc. and to incentivise AMME collaboration. The NI engineering brand should be developed and promoted and used by all relevant parties to promote NI as a location of choice to do AMME. To address issues relating to accessibility, a “See Inside Manufacturing” or “Manufacturing Day” initiative should be developed to help influence skills choices – “heads and hands”. Develop a programme of education for the legislators. Prioritise the identification of a cross-party Executive ‘Advocate for Engineering’ – (e.g. the UK All-Party Executive Manufacturing Group model). Matrix can lead. Matrix ‘loop and closure’. Need to set out the mechanism by which to bring AMME findings into the advice framework (evaluation of the model) and carry through the development of recommendations through a sub-group which would co-opt representatives from respective communities. Likewise, a conduit to UK government policy and funding should be formalised for NI AMME businesses – a continuing process which will provide feedback and input to next report. Matrix can work in conjunction with DfE to provide leadership. The ‘clean and green’ opportunity is an area which was initially identified in the first Matrix report and one which has been seen only to grow in the intervening period. NI’s AMME companies should therefore be encouraged to explore and supported to engage further with the ‘clean and green’ opportunity, whether through education, the creation of shared value or the identification of partners. As part of the research for the AMME report, we asked Business Eye editor Richard Buckley to conduct interviews with the leaders of some of the most innovative companies in the sector. The NI AMME sector is diverse, with activities ranging from aerospace, automotive, electronics, pharmaceuticals, and chemicals to heavy plant, automotive, agri-tech equipment and construction products. 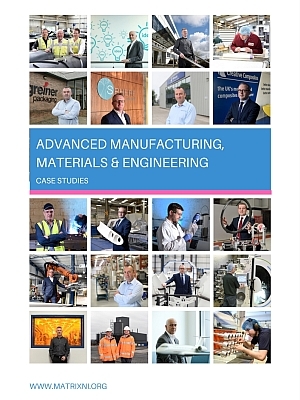 These case studies illustrate the strength and vibrancy of the wider AMME sector. You can click on the links below to read the case studies, or download the full case study report.